Aztec society heavily depended on water, not just for their everyday use but also as a critically important part of their lives. That’s because Aztecs were primarily agrarian, depending on agricultural produce year after year. For adequate harvests of crops, they needed a certain amount of water supply each year. Aztecs resolved this by constructing canals and aqueducts from water bodies to their cities, not only supplying water but also storing it for future use. The Aztec capital of Tenochtitlan itself was situated on a lake, but the lake water was salty and unsuited for human consumption. So Aztecs built a canal from the island city to the shore of the lake where freshwater springs existed. The Aztec capital city Tenochtitlan was located on an island in Lake Texcoco. So while the city had abundant water for agricultural purposes, they didn’t have any freshwater for drinking because the lake’s water was salty. To resolve this problem, Aztec engineers built a canal from the island of Tenochtitlan to Chapultepec, a place on the shore of the lake which had many freshwater springs. For this purpose, a large causeway was first built, constructed with rocks, sand and wooden stakes. A canal was then built on this causeway and water from the springs was transported to the city through this canal. One of the most popular methods of cultivation used by Aztecs in Tenochtitlan was to use floating gardens on the lake water. This was done by carefully staking out plots on the lake surface, then using canoes topped with dirt and sand. Different crops were then grown on these artificial gardens called chinampas. Between chinampas on the Lake Texcoco, Aztecs maintained canals. These canals allowed transportation from one point on the lake to another via a canoe and also allowed the Aztecs to hunt for fish and water fowl. 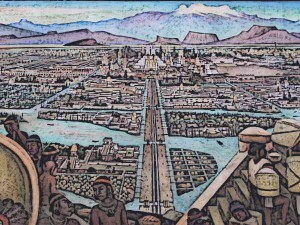 The city of Tenochtitlan was the largest urban centre in the pre-Hispanic Mesoamerica. Modern-day researches have estimated that the city had a population ranging from 100,000 to 200,000. Such a huge population needed well-planned supply of freshwater. So while the Aztecs constructed canals bringing freshwater to the city, they also lined the city itself with canals so that the freshwater supply could reach all parts of the city. 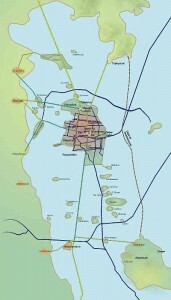 This network of canals also helped quick transportation within the city. In total, three broad causeways existed in Tenochtitlan and countless smaller canals joined them. Aztecs were excellent builders and engineers and the city of Tenochtitlan was a stunning example of this. The city was located on Lake Texcoco but the water of the lake was salty and couldn’t be consumed by the city’s huge population. So the Aztecs built large causeways to connect the city to the freshwater springs on the shore, and then built a large network of canals within the city so that the freshwater supply could be distributed to all parts of it. The Aztecs also constructed canals on Lake Texcoco between floating gardens called Chinampas.